My fellow journalist, Irshad Ahmed Mastoi Baloch, was killed in broad daylight at his office in Quetta. He was one, of few, brave journalists who would criticise the establishment’s unjust policies towards Balochistan. His fellow trainee reporter, Abdul Ghulam Rasool, and a serving accountant, Mohammed Younus, also lost their lives in the incident. I cannot believe or understand how an incident of this magnitude could have occurred in a sovereign, democratic country. He was doing his job, work that he was hired to do and obviously doing well. But he was, they were all, killed for merely performing their professional obligations. The assailants opened fire indiscriminately and that was the end of it. I condemn this brutal murder – not only because he was an associate of mine but because this is not the first time such an incident has taken place to silence those claiming their right under freedom of speech. And like always, this case too will go unnoticed. It will be swept under a rug, without any second thoughts. They may form a pile, like the mass graves discovered, but that is all that will ever happen. Condemnation and selective amnesia. Irshad was just 35-years-old when he was murdered. He was born in the Jaffarabad district of Balochistan. He started working as a professional journalist in the year 2000 and had worked for different Urdu and Sindhi newspapers as well as TV channels. He was also working for an online news agency, the International News Network, as the bureau chief in Quetta and was considered a well-known columnist. He worked under severe conditions and was under constant threats from spy agencies and militant outfits in the province but his commitment to work and his courage never wavered. The agonising truth is that he was killed for doing his job, just like many other journalists are killed in Pakistan for speaking the truth. But what’s even worse is how Balochistan keeps losing journalists and intellectuals every passing day, resulting in many moving to cities like Karachi, Lahore and other parts of Pakistan amid life threats and uncertainties in the province. Both federal and provincial governments have failed to provide security to these people under such threats. There are very few options for journalists in Balochistan who are pro-justice; they can either leave the province, and in turn leave their fight for justice, or they can continue their work and eventually stand on the receiving end of a bullet. No doubt, journalists in Pakistan operate in an environment where attacks, intimidation, torture and abductions are vehement. But in Balochistan, these threats go up to a whole new level. Since 2001, Pakistan has remained one of the world’s most dangerous places for journalists. According to the 2014 report of the Committee to Protect Journalists (CPJ), 44 journalists have been killed in Pakistan in the past decade. Pakistan ranks ninth in the 2014 impunity index of CPJ. Pakistan has become a place where journalists are working on the mercy of spy agencies, militants and armed wings of political parties. The attackers, however, have it easy. They escape justice because they are never chased. They escape justice because journalists are a dime in a dozen. So what if they are living, breathing people who have families who love and support them as much those people reading this piece? That is how Balochistan is treated anyway, why would a mere journalist change anyone’s opinion on the matter? Pakistan ranks 158th out of 180 countries on the 2014 World Press Freedom Index according to the Reporters Without Borders (RSF). Last year, in 2013, eight journalists were reportedly killed in Pakistan and this year six journalists have been killed so far, alongside the failed murder attempts on senior journalists, Hamid Mir and Raza Rumi. “A critical step will be taken for Pakistan to investigate its own military and intelligence agencies and ensure that those responsible for human rights violations against journalists are brought to justice”. However, Pakistan’s infamous record for press freedom is the worst in Balochistan, compared to other provinces. Approximately 36 journalists have been killed in the last six years, making Balochistan a battlefield and most agitated province for journalists in Pakistan. “Balochistan has been transformed into a battlefield for Baloch journalists, in order to prevent them from covering unabated human rights violations in the province. The murder of Baloch journalists is an inordinate loss for Balochistan, which can never be compensated. It is hard for journalists and activists of civil liberties to practice their responsibilities in Balochistan without any fear”. In Pakistan, since 2001, verbal threats and methods of intimidation have made the ugly transformation of physical threats; journalists are targeted, by militants and other agencies, with complete impunity. And in most cases, other journalists are not allowed to grieve or voice their concerns on the matter; those who do suffer the fate of Raza Rumi and Hamid Mir. If a journalist is not permitted to write or state the facts as they are, what good is his profession? Get rid of the profession, once and for all, and save thousands of lives from this impending doom. In Balochistan, there are certain areas that have been cordoned off for journalists; things that happen within that area cannot be spoken off. But can you just imagine what must be happening?! Human rights violations, missing persons, mass graves could just be the beginning. But when journalists, like Irshad, who dare to write op-eds or reports on these sensitive issues are either murdered or abducted in broad day light, in the lawless province of Balochistan, why have journalists at all? A country where journalists are attacked to suppress the idea of an independent press, one wonders whether there is any freedom or democracy at all. In Balochistan, where there is complete media blackout, what is a journalist supposed to do? Not report the truth? The fact that an individual has to choose between ethical journalism and one’s own life is injustice in true form. But yes, please do go back to reading about the long march in Islamabad or the next best TV series; thinking about the injustices in the profession of journalism or the lives of Baloch people is just an inconvenience; neither will be around forever anyway, right? My apologies for wasting your precious time on this truly morbid, truly real story of injustice. 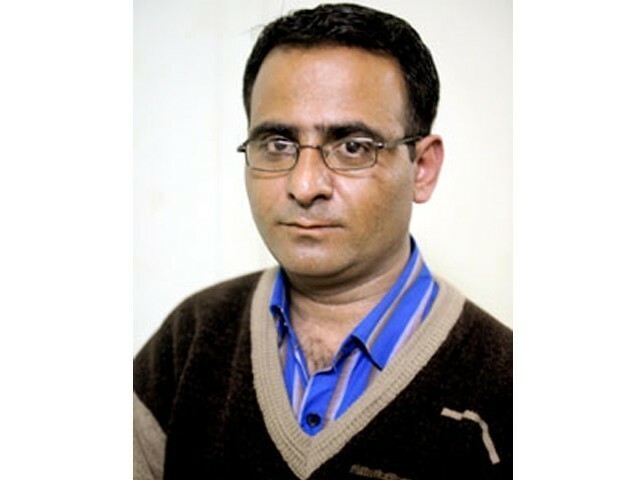 A Lahore based researcher and human rights activist, he has completed a Masters degree in Media and Communication from the University of Balochistan, Quetta. What do you mean by “culturally and ethnically” different?Pakistani isn’t an ethnicity, it is a nationality, Pakistan is a diverse country with many ethnic groups; Sindhis,Kalashas,Seraikis,Pashtuns,Punjabis,Chitralis,Kashmiris,Memons,Makranis etc are all different from each other, and the Baloch are part of that diversity, in fact Baloch people have many similarities with Sindhis and Pashtuns, they have more in common with them than they do with Kurds or Persians. There is no such difference of culture and ethnic. Baloch are Pakistanis, more than Pakistanis themselves.